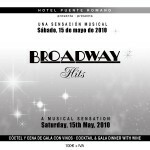 Fire Aid Concert at Hotel Puente Romano an Outstanding Success – Press Release | Marbella Marbella – Adelante! A capacity audience had purchased tickets at €15 and €25 prices and some front row guests paid €100 for €25 VIP tickets. 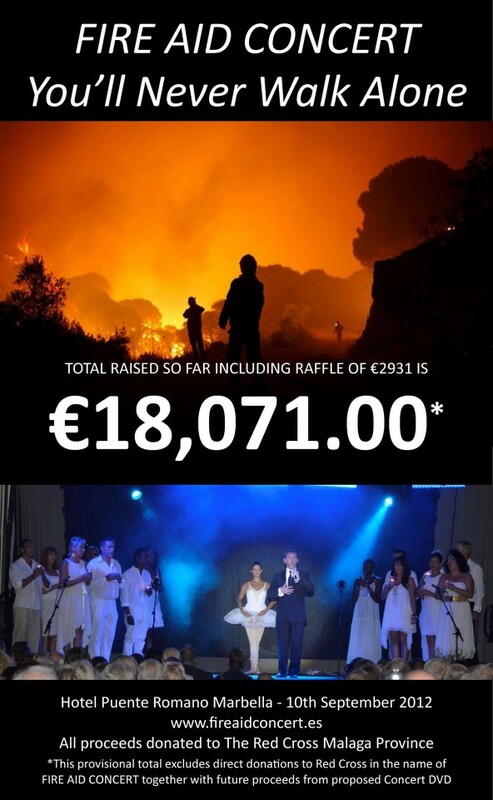 With the sale of raffle tickets (€2931.00 of the total raised) and further donations on the night, we are pleased to announce that the evening itself generated €18,071.00. This figure excludes any amount that has already been donated direct to the Red Cross Fire Aid Concert fund together with any future proceeds from the proposed Concert DVD (details of the DVD and the final amount raised will be announced in due course). The co-organisers – Maurice Boland and Nick Holland-Morgan are extremely pleased with the outstanding success of this event which far exceeded everyone’s expectations. The Production by Steve Shappelle and Helena Paul was seamless and professional with the fantastic array of star performers, honouring the Services that helped. The Concert opened with an extremely poignant rendition of You’ll Never Walk Alone by tenor Stephen Lloyd-Morgan accompanied by Tania Rahmany, a ballet dancer from the Marbella Dance School, and joined by the specially formed Fire Choir; the audience were reminded of why everyone was in the Andalucia Ballroom as a compilation of images from the tragic Fires were shown on large screens. Many members of the audience were in tears as they watched this and rose to give a standing ovation as representatives from the Services came on stage. Representatives included Military Pilot Capitan Juan Rodriguez, National Police Inspector Lidia Avivar Castro and Chief Commissioner of Malaga Don Nicolás Meca Rodriguez de Rivera and Subinspector Miguel Angel Benitez and Policia Angel Gonzalez. Following a speech given by the President of the Red Cross Marbella D Julián García Aguilar and joined on stage by his fellow Presidents from Mijas – D Luis Miguel Díaz, and Coin – D Carmen Vacas, everyone was treated to an international variety show of singers, dancers, groups of all nationalities including international superstar Madeline Bell. Tribute band “Four Tops” had just finished a show in Torremolinos earlier that night before rushing to Marbella to participate as one of the final acts. With the audience rocking, Mel Williams and his Rock Pack led the company of Fire Aid choir to a standing ovation finish. Audiences on leaving the auditorium were full of praise “What a superb concert; best we’ve been to on the coast”, “unbelievable value tickets”. On top of the money raised at the concert, donations are also being made direct to the Cruz Roja bank account at Unicaja: (llamamiento FIRE AID CONCERT 2103 1001 50 0030002823) for those who couldn’t attend the event. Seven days, over 150 volunteers, services and products donated by local organisations, shows the desire of individuals to come together to support our local communities in times of disaster. The Fire Aid Concert team would like to thank everyone for supporting this event.